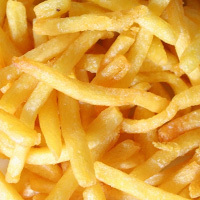 French fries also known as fried potatoes are stringy sliced potatoes fried in oil. It can be made using sliced potatoes are powdered potatoes shaped ready to fry. Making French fries at home is best done using cooking oil set between 170 and 180 degrees Celsius. Cooking potatoes in an oven is a good way to reduce calories in fried potatoes. The calories in French Fries per 135g(1item medium) is 320 calories. French Fries is calculated to be 237Cal per 100 grams making 80Cal equivalent to 33.76g with 43.74g of mostly carbohydrates、14.31g of fat、3.92g of protein in 135g while being rich in vitamins and minerals such as Vitamin C and Vitamin K.